Kishore acts galore – enjoy these clips from various movies. This entry was posted on Saturday, August 4th, 2007 at 9:05 am	and is filed under Specials. You can follow any responses to this entry through the RSS 2.0 feed. You can skip to the end and leave a response. Pinging is currently not allowed. 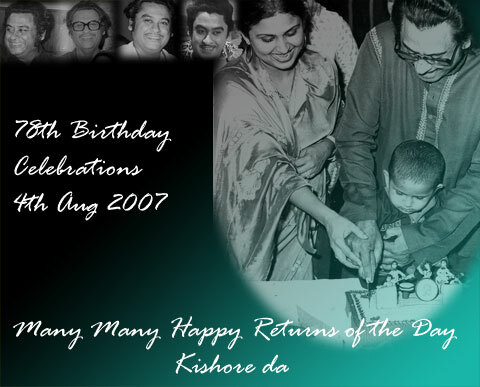 happy Birth-Day to guru(kishore da)……………. I have a very deep relation with MUSIC,and same as kishore da.IF he was not,we cann’t get the right way indian music.He is alive today and still with us. Dada -A very happy birthday to you. I wish Kishore Kumar a very happy birthday on his 78th year. i listened to Guru when i was doing my matriculation in 2002.since then ive been listening to his magical voice constantly and now following his style i, myself has started to sing. i didnt know anything abiout practical music, but now i can sing,can yoodle.i consider that person as my taecher. many people have earned fame fo;;owing his style. He is really a legendary singer. we all indian will misshim n his songs ……………………. This Guru Ji is such a Man who caryy lots of thing…he carry Love, Emotions,Sadness,Happiness,Crazyness,Respect,manliness…infinety…how ever..do u think this man need anything…well i m damma sure tht every one understand that wht i means to say…Yes Freinds Kishor Da is a God..well I think his Voice Motivates such that the Voice can change anyones mind and fellings…well a God only can do such kind of miricals…From All of Kishore Da’s Lover…Kishore Da We Love you So Much…..
kishore is a legend. he is gandharva born on earth due to some curse. he went back to his heaven. you are all time genius, wishing you a very happy birthday, you made our life with full of ramance.